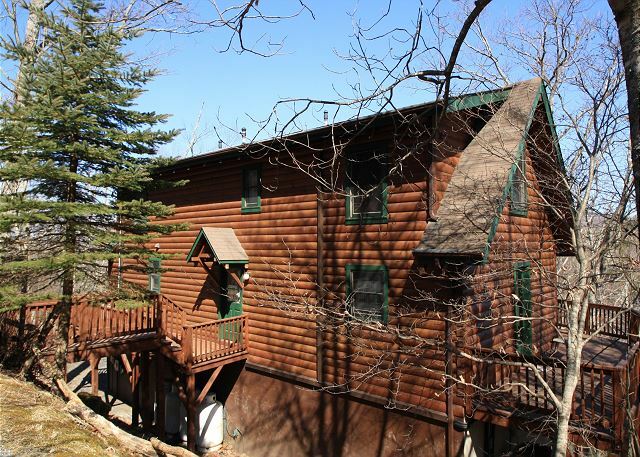 This spacious 3 bedroom 2 bath log cabin is located off the beaten path on 3 acres with a great year round view. Tongue and groove interior with hardwood floors give this two level home a rustic feel. The living area has a cathedral ceiling with a two story rock gas fireplace, flat screen satellite TV VCR/DVD, AC, internet, and large open deck. 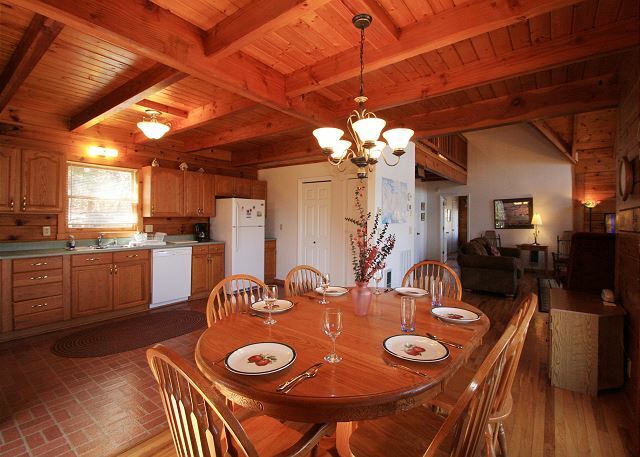 Well equipped galley kitchen with dining for 6. 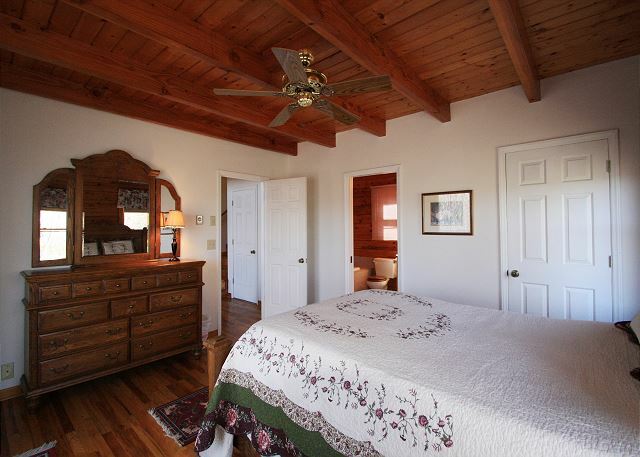 The master bedroom is on the main floor with deck access and a private bath with a whirlpool tub (no shower). 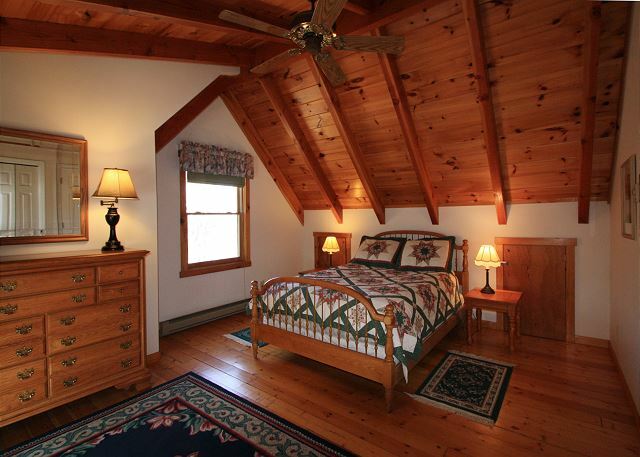 Upstairs loft balcony overlooks living area accesses two guest bedrooms, each one with a queen and a shared bath. Pet Friendly. Four wheel drive required in winter weather. Property maps may not be accurate on 3rd party web sites. Please contact the office directly for exact property locations. We were blessed that we could find this lovely house on short notice. As Florence was bearing down on Fayetteville, my husband's university closed. We had no reason to stay home, so we came to Boone. 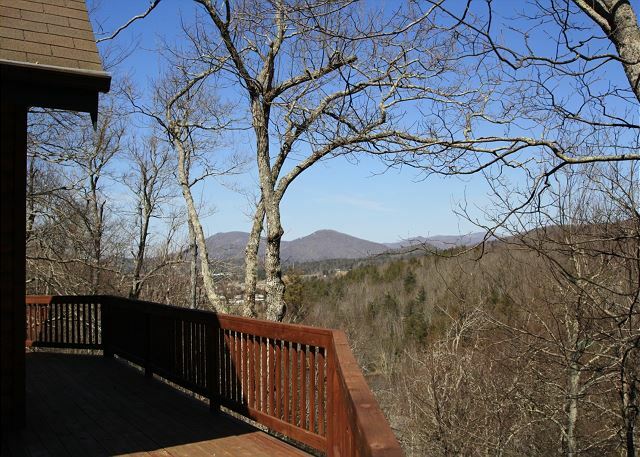 We enjoyed the beautiful setting with a view of the mountains and trees off of the large back deck. The only drawback was lack of a shower in the main floor bathroom. We had a great weekend visiting our daughter that attends App State. 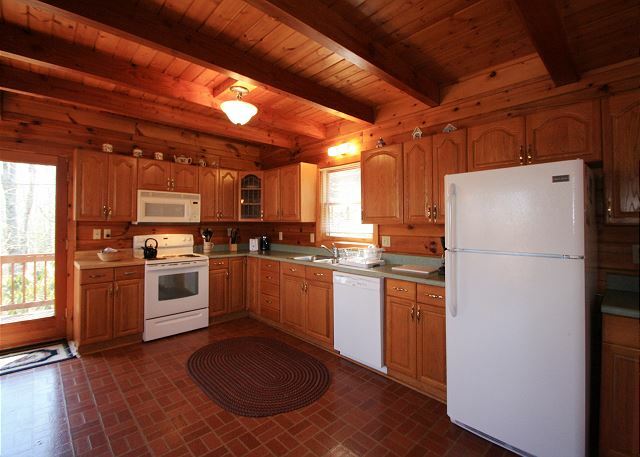 Great location to campus, king street, blowing rock. Very clean, great beds, nice views. I would rent it again. Our stay at Blue Vista was nice. The houses location can't be beat. 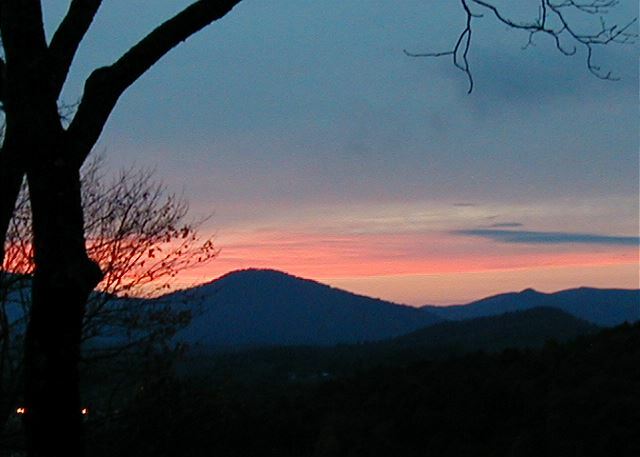 Easy to get to Boone or Blowing Rock and a quick jump onto the Parkway. The house was well equipped with all kitchen gadgets and games to pass the time. The view is unmatched. It was so nice to stand out on the deck and have a cup of coffee in the morning. And of course we loved being able to bring our dog with us on vacation. The two negatives for this house were the bathroom situation that has been mentioned in other posts. We used the upstairs shower but the shower head was very low, making it touch on tall adults to easily wash their hair. I would suggest both bathrooms be updated. Also there is minimal furniture on the large deck. A rocking chair would have been nice rather than standing to enjoy the view. All around a great stay. Thank you for taking the time to leave a comment. I passed your review on to the owner, she informed me that there are 10 chairs on the deck and 2 rocking chairs inside the house that could be brought out. Everything about this cabin was perfect! We had 4 adults and 2 kids (ages 4 & 6) and everyone really enjoyed staying here. The place was very clean, spacious, and cozy. 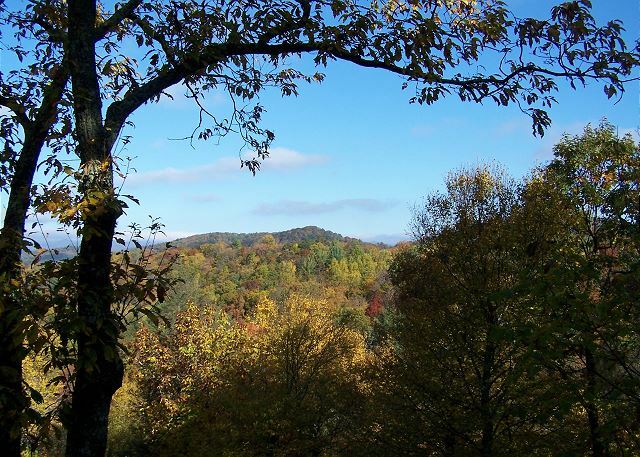 It was in a nice remote location, but still fairly close to the Blue Ridge Pkwy, Boone, and Blowing Rock. The property management was pleasant to work with and checking in/out was easy. We brought our own linens and towels, but everything else was provided (glass, plates, pillows, etc). I would highly recommend this place or if isn't a good fit at least checking out the other properties managed by the same people. 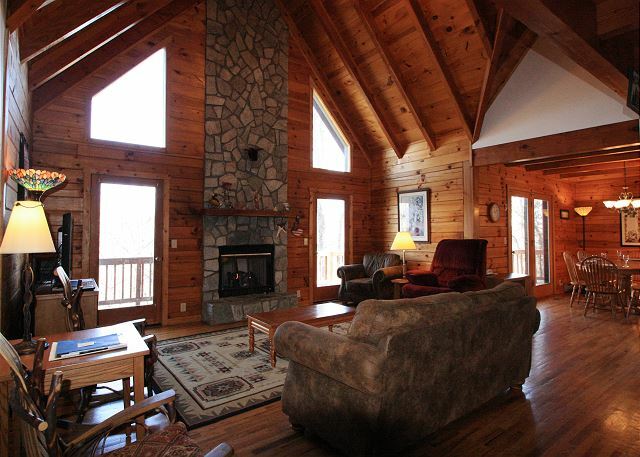 Rented this cabin for Thanksgiving weekend to explore the town of Boone, NC and look for a Christmas tree. 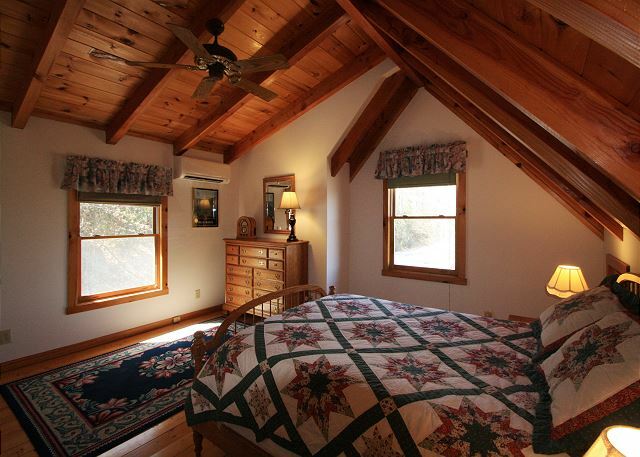 The area is beautiful and this cabin provided an amazing view of our surroundings. We enjoyed our visit. Relaxing environment with a great view. Close to the center of Boone. Great value. Overall vacation experience was favorable and we would rent it again. The view was lovely, but would be enhanced with some tree trimming. The property was clean with everything in working order except one of the burners on the stove. Beds were comfortable (we brought our own linens). One thing I didn't like was having to dispose of our trash. We had to drive around town looking for a dumpster. Overall, our stay was good. Thank you for taking the time to leave your comments. I have someone checking the stove eye, sometimes it's just not connected well. We do supply you at check in the location of the closest dumpster site to the house. I appreciate it's a bit of an inconvience, but unfortunately trash pick up is not offered out in the county only in town locations. We hope you come back to see us soon! The cabin is very nice open space for a group to meet in. Could use some updating, but the views off the long deck were great!! Also the location was very good. Easy to get to Boone or blowing rock. The big downfall was only 1 shower so would not stay there again. Good location. House was in excellent condition when we arrived!Hats off to housekeeping! 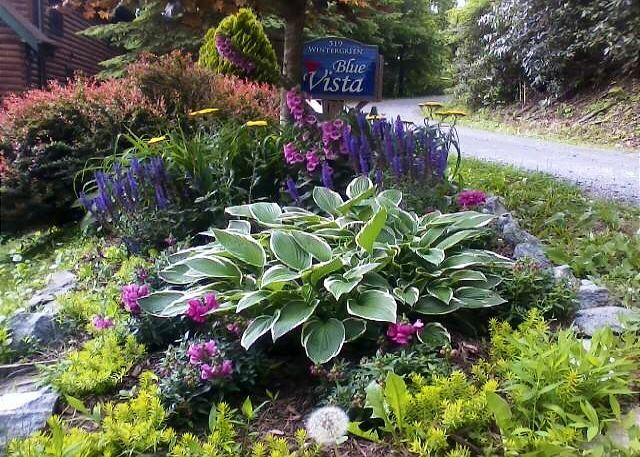 We rented Blue Vista for a month in September with friends and had a lovely visit in the Boone area. The home was clean and very comfortable...we felt right at home immediately! Love the secluded feeling and we spent a lot of time sitting on the balcony watching bird and the mountains in the distance. We missed having a shower in the master bath and would like to see screens on more than just two doors so we could have opened the entire house up without worrying about flies or mosquitoes. All in all we love the house and layout and especially enjoyed the fireplace for cozy evenings. Nice house and good location. The only negative-no shower in master bath. Thank you for taking the time to leave your comments. So you are aware for the next time, the owners are looking into installing a shower on the main floor. We look forward to your next visit. great home away from home. our family loved it. 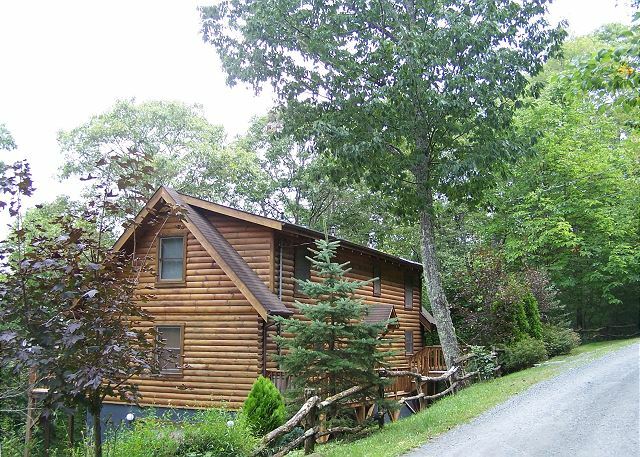 Comfortable, clean house near Boone. Nice deck with a fair view. Enjoyed our stay in early - mid spring.